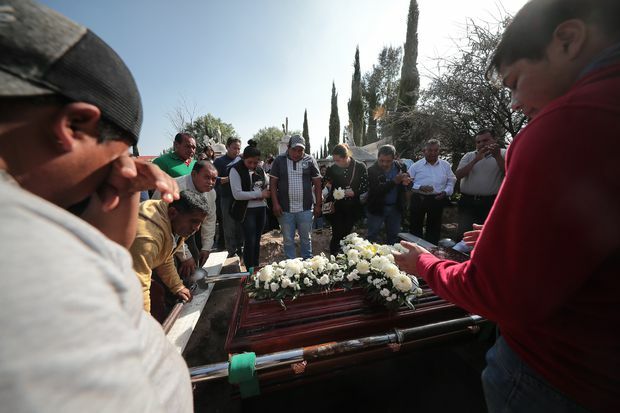 Friends and relatives say a final goodbye after the funeral services for the victims of a Pemex pipeline explosion in Tlahuelilpan, Mexico, on Jan. 20, 2019. A gasoline pipeline explosion in central Mexico last week killed at least 89 people, the country’s Health Minister said on Monday, while an official with the state-owned oil company defended its response to the leak. There were also 51 people injured, Health Minister Jorge Alcocer told a morning news conference. Friday’s pipeline blast happened after hundreds of people had rushed to collect fuel from the gushing pipe. Over the weekend, a series of possible missteps by the current government became clear, from the delay in shutting off the pipeline, to relatives saying fuel shortages caused by the government’s anti-theft policy attracted people to the leak. Mexican Attorney-General Alejandro Gertz said that any negligence by authorities is being investigated and that officials involved would be called in to answer questions this week.